In the fossil record, there are a number of different tetrapodomorphs, or transitional species between fish and four-legged vertebrates called tetrapods. Most date back to the Devonian period, often called the "age of fish," roughly 393 to 359 million years ago. These creatures probably lived in a number of environments, from the bottom of the ocean, to the shallow waters of rivers and streams, to mudflats, explains Neil Shubin, a paleontologist and evolutionary biologist at the University of Chicago. What's more, "they were different degrees of transitional, with some being more closely related to tetrapods than others," he told io9. In 2004, Shubin and his colleagues discovered Tiktaalik roseae, a tetrapodomorph that is more closely related to tetrapods than all others. This 375-million-year-old animal looked like a cross between a fish and a crocodile, and had a mix of fish and tetrapod-like features, which the researchers first described in the journal Nature in 2006. On the fish side of things, Tiktaalik had scales, fins and gills. But it also had primitive lungs, a flat head and a mobile neck. Additionally, Tiktaalik had shoulders, elbows and partial wrists bones that likely allowed it to prop itself up and walk in shallow waters (and potentially on land). At the field site in Ellesmere Island, Nunavut, Canada, the researchers initially uncovered three specimens of Tiktaalik. They soon found a few more. "But pretty much all we had was the front end of the animal," Shubin said. 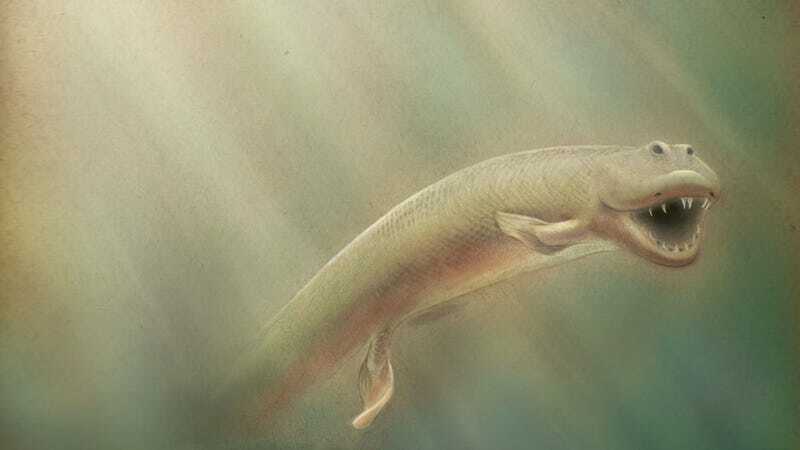 The team expected that Tiktaalik would have had relatively small pelvic appendages that were unable to support its body weight, based on the fossils of other tetrapodomorphs, which had enlarged pectoral fins and robust pectoral girdles similar to Tiktaalik. This would mean that all tetrapodomorphs discovered to date were "front-wheel-drive animals" that could around by using only the front limbs, while the back limbs dragged along behind. The evolution of hind legs, then, only occurred after animals transitioned on to land. But Shubin and his team uncovered new fossils that changed everything. To be exact, the new fossils are actually old fossils. When the researchers unearthed the original Tiktaalik "type specimen," which they used to describe the species, it came in a very large block of rock — too large to transport back to the research facilities over 3000 miles away in one piece. So the researchers broke the block into two pieces. "We prepared the first block in 2006, but the other one wasn't prepared until a few years later," Shubin said. This second block, they found, contained the back end of the original Tiktaalik specimen. By analyzing the fossil, the scientists found that Tiktaalik 's robust pelvis was very different from other tetrapodomorphs, and actually closely resembled the pelvis of early tetrapods. In particular, the animal's pelvic girdle was the same size as its shoulder, which is a feature present in early tetrapods. As a comparison, Tiktaalik's pelvis is 1/12th of its body length, while the pelvis of the tetrapodomorph Eusthenopteron is only 1/20th its body length. The fossil also contained a partial pelvic fin — the researchers inferred that Tiktaalik's hind finds were comparable in size to its forefins. The hind fossil also showed a mix of primitive and advanced features. For example, Tiktaalik lacks a particular rib that connects the pelvic girdle with the vertebral column in tetrapods. But it has an iliac crest (crest on the upper pelvis where muscles attach) that is more massive and expanded dorsally than it ever is in fish, suggesting that the fins had some unique, advanced functions. It also possessed a large and robust ball-and-socket hip joint that would have allowed a wider degree of rotation than early tetrapods and other tetrapodomorphs. In all, the find suggests that Tiktaalik had a large range of body and fin motions it could execute. On the one hand, it could have used its fins as swimming paddles. But it also could have used all four limbs to walk around in its aquatic habitat, instead of using the front-wheel-drive mode of its tetrapodomorph relatives. Tiktaalik shows that "many of the major features of tetrapods, such as the mobile neck, flat head and hind legs, actually began in fish," Shubin said. That is, the emphasis on "pelvic-propelled locomotion" is a trend that initially began in finned tetrapodomorphs and was later enhanced or exaggerated by the first limbed land animals. Check out the study in the journal PNAS. Top image via Kalliopi Monoyios/University of Chicago. Video via Kevin Jiang/University of Chicago.